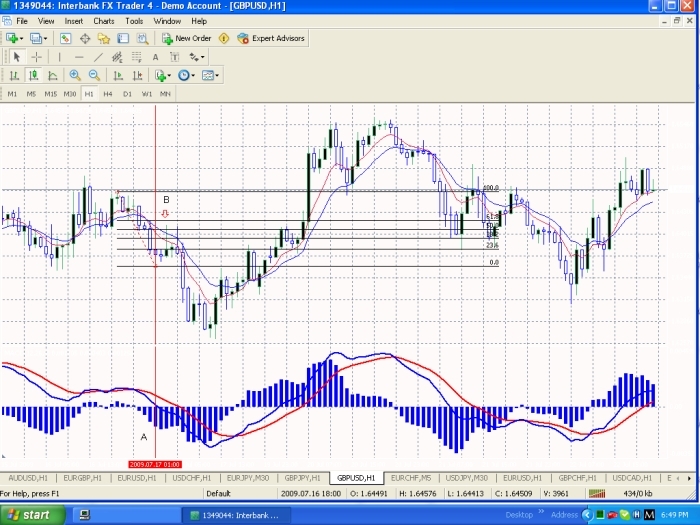 This is a trend trading system, based on Fibonacci support and resistance. The trend is determined by the EMA’s. EMA means Exponential Moving Average, and it provides a faster reaction to the trend in comparison to a simple moving average. 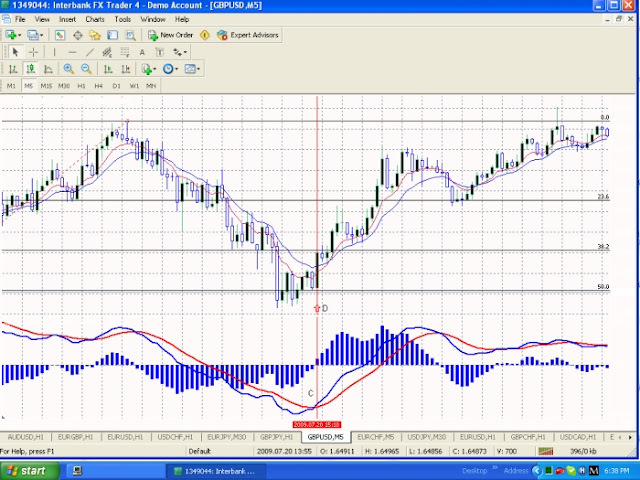 The MACD (Moving Average Convergence Divergence) is used to confirm the trend. I use it to confirm a down trend when the MACD has crossed down below its signal line and to confirm an up trend when MACD has crossed up above its signal line. 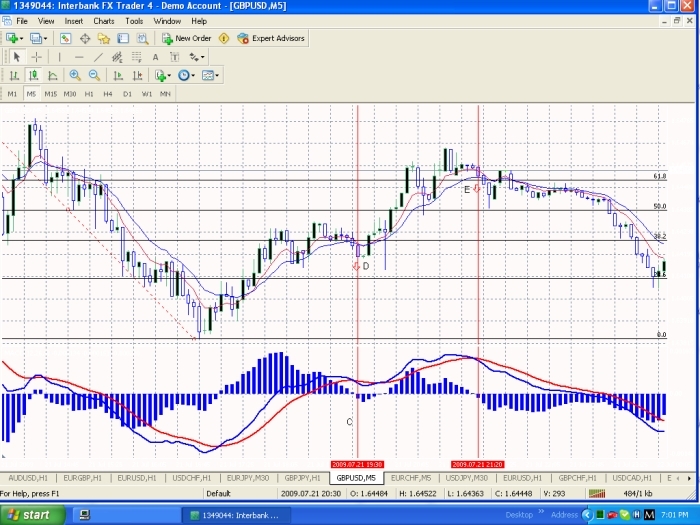 The MACD histogram is used for entries on the 5 min chart. On the 5 min chart when the histogram pops up from below the zero line this signals an entry to the upside .When the histogram goes below the zero line this signals an entry to the downside on the 5 min chart. After you determine your trend you want to look for your most recent swing points (swing highs & swing lows).A swing high is the highest point of the highest candle or bar in a price movement. A swing low is the lowest point of the lowest candle or bar in a price movement. Once you have a trend and you are able to find a swing high and swing low to draw a Fibonacci retracement from, mark the retracement levels. You will have a good idea of where support and resistance is in the market based on the retracement levels. I also use candle charts, but bar charts can be used, there is no advantage of one over the other in terms of how I use them. Lot Size – Not more than 2% of account balance on any one trade. Add the 7 EMA, Add the13 EMA, Add MACD (12, 26, 9). Find your most recent swing points to draw your Fibonacci Retracement from. The 7 EMA needs to be below the 13 EMA on the 1 hour chart. MACD should be crossed to the down side on the 1 hour chart. 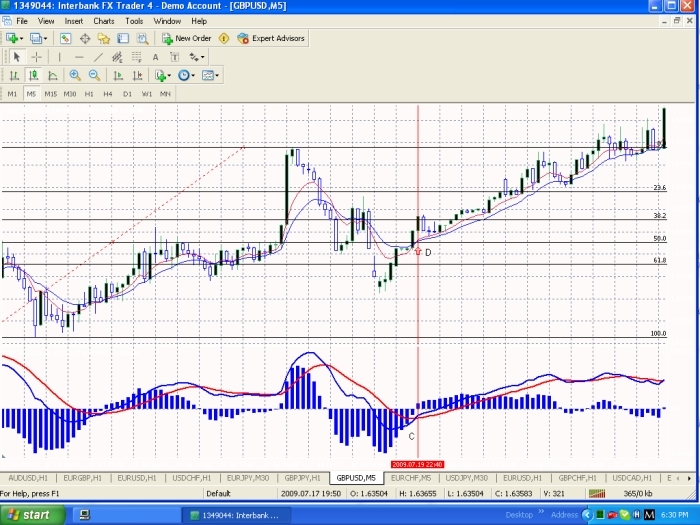 Find your most recent swing points and draw your Fibonacci retracement. Wait for price to retrace to at least the 38% retracement level and no more than the 78% retracement level on the 1 hour chart. 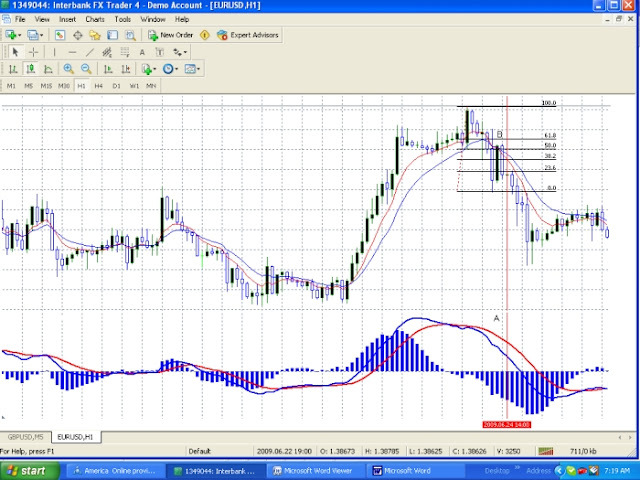 Stops and limits can be based on previous swing highs and lows on the five minute or hourly charts. I personally use a 15 to 20 pip stop based on my entry point. You have to decide this based on your own risk/reward tolerance. Never risk more than what you see as your profit potential. The 7 EMA needs to be above the 13 EMA on the 1 hour chart. 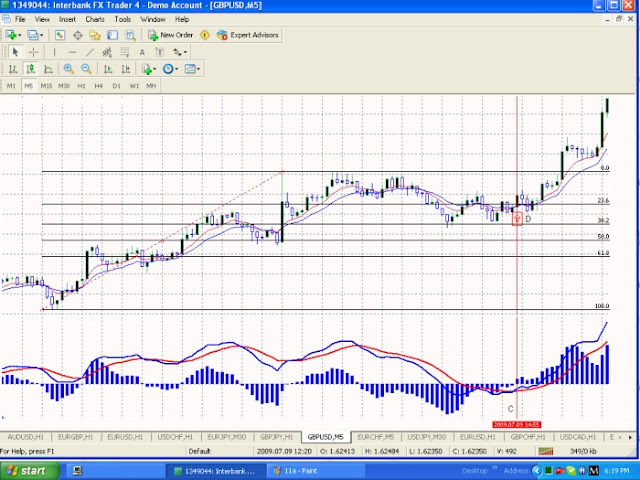 MACD should be crossed over to the up side on the 1 hour chart. 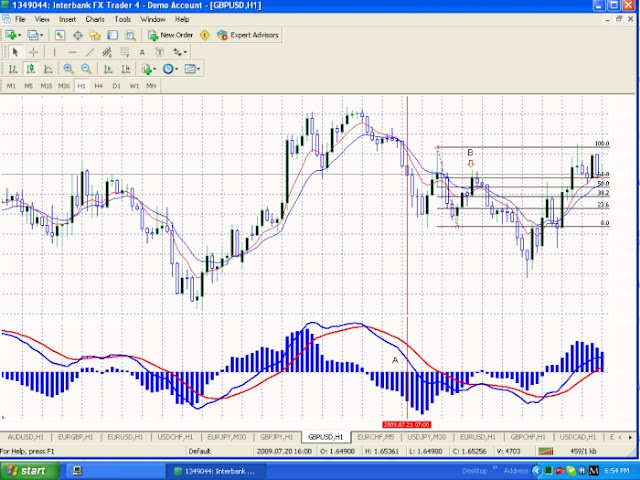 Go to your 5 min chart for entry. 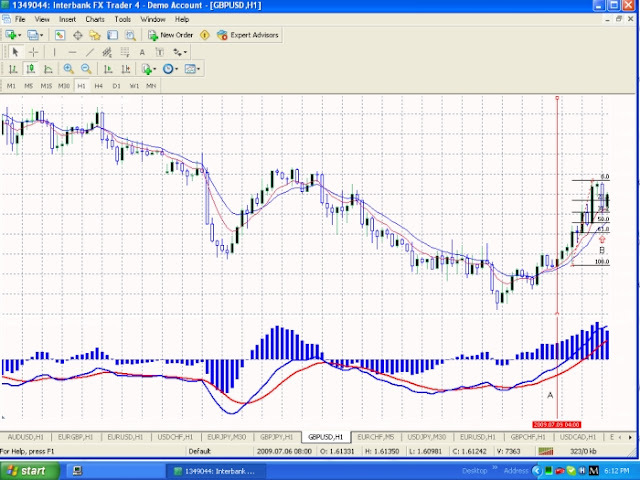 Wait until the MACD Histogram forms a new bar above the zero line then open a Buy order. The 7 Ema is below the 13 EMA. 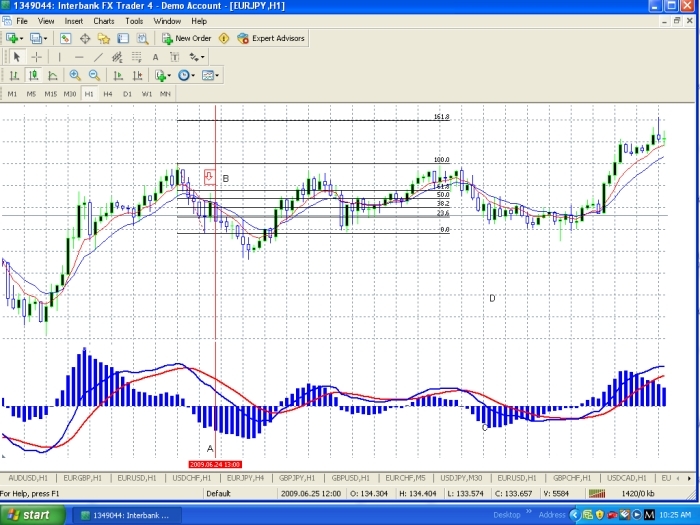 The MACD is crossed down at point (A). All points are marked on the chart. 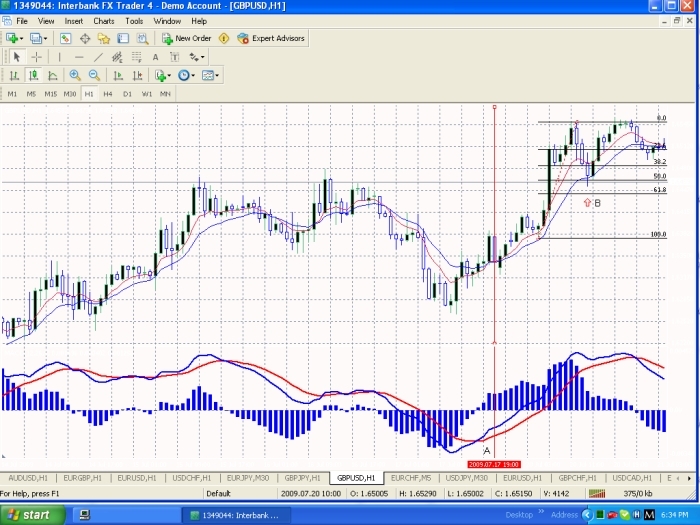 Find your most recent swing points to measure your Fib retracement from. I have drawn my Fib Line using the most recent swing points. Price has retraced close to the 61.8% level at point (B). Go to your 5 min chart. At point C the histogram has gone below the water line. At point D enter short at the close of that candle, because the histogram has gone below the zero line. The red arrow at point D marks the entry. Your limit can be the previous swing low on the 1 hour chart or a pivot point. Your stop can be a previous swing high on the 1 hour chart or a pivot point. You have to decide that based on your risk versus your reward. Price fell over 100 pips. 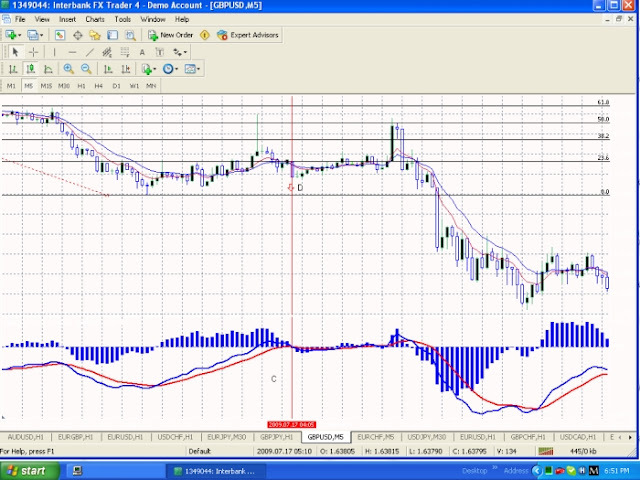 The 7 Ema is below the 13 Ema on the 1 hour chart. The MACD is crossed down at point (A) on the 1 Hour chart. 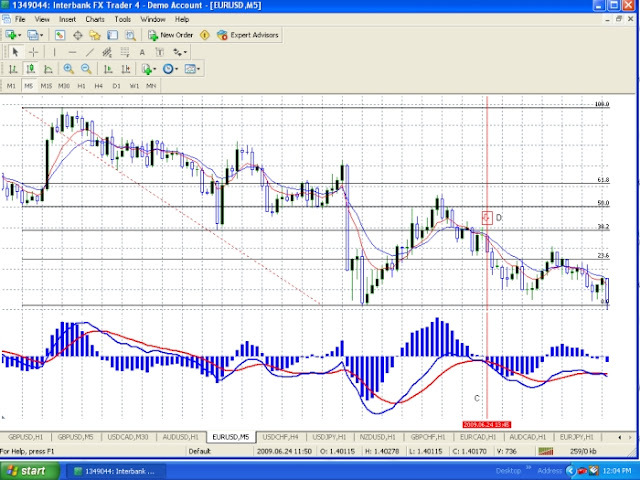 Find your most recent Swing points to measure your Fib retracement from on the 1 Hour chart. Price has retraced to the 38.2 % level at point B on the 1 hour chart. At point C the histogram has gone below the zero line. Point D marks the entry. You have to decide that based on your risk vs your reward. The MACD is crossed down at point A on the 1 hour chart. 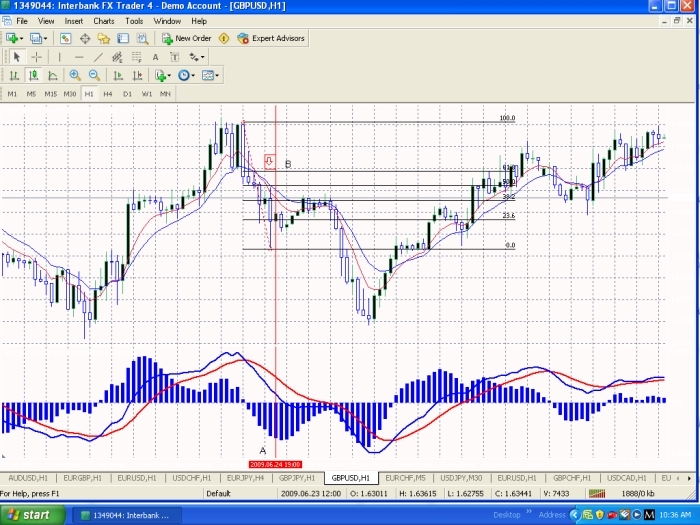 Find the most recent swing points to measure the Fib retracement from on the 1 Hour chart. The points I used to draw the Fib retracement are the most recent swing points. Price retraced to the 50% level at point B on the 1 hour chart. Price has retraced to the 50% retracement level at point B on the 1 hour chart. Your stop can be a previous swing high or a pivot point. Find the most recent swing points to measure your Fib retracement from. The points I used to draw the Fib retracement are your most recent swing points. 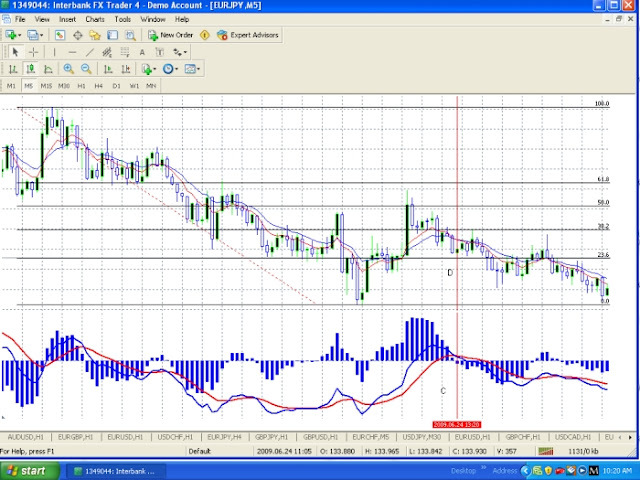 Price retraced to the 61.8% levels. Go to your 5min charts. At point C the histogram is below the zero line. At point D enter short at the close of that candle. As you can see from this example price continued to retrace up after your entry. So if you put your stop at the previous swing high you would have been stopped out. That is where risk and reward plays a critical role. All trades are unique. Now if you were stopped out, Point E provides you with another entry, based on the entry rules. Your limit can be the previous swing low on the 1 hour chart or a pivot point. The 7 Ema is above the 13 Ema on the 1 hour chart The MACD is crossed up at point A on the 1 hour chart. Find your most resent swing points to measure your Fib retracement from. Price traced to the 38% level. At point C the histogram is above the zero line. At point D enter long at the close of that candle, because the histogram is above the zero line. Your limit can be the previous swing high on the 1 hour chart or a pivot point. You have to decide that based on risk vs. reward. Price went up over 100 pips. The 7 Ema is above the 13 Ema on the 1 hour chart. The MACD is crossed up at point (A) on the 1 hour chart. Find your most recent swing points to measure your Fib from. The swing points I used to draw the Fib retracement from are your most recent swing points. Price retraced to the 61.8% level. At point C the histogram has gone above the zero line. The entry candle is marked by the red arrow at point D.
Your limit can be the previous swing high or a pivot point. Your stop can be a previous swing low on the 1 hour chart or a pivot point. You have to decide that based on your risk vs. your reward. Price went up over a 100 pips. The 7 mea is above the 13 mea on the 1 hour chart. 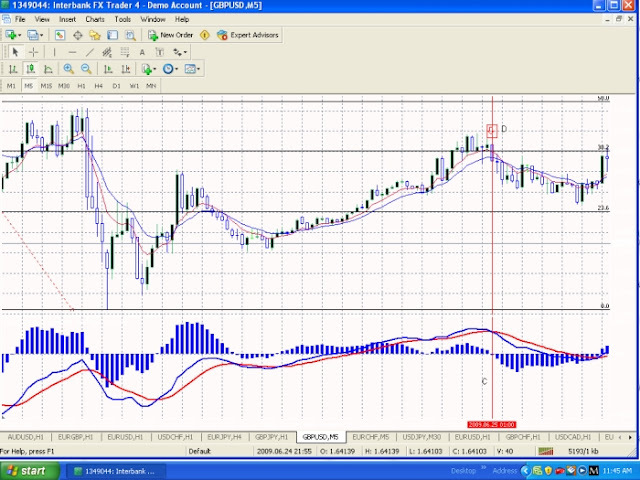 The MACD is crossed up at point A on the 1 hour chart. Price retraced to the 50% level. At point D enter long at the close of that candle, because the histogram is above the zero line. The entry candle is mark with a red arrow at point D.
Your limit can be a previous swing high on the 1 hour chart or a pivot point. You have to decide that based on you risk vs. your reward. 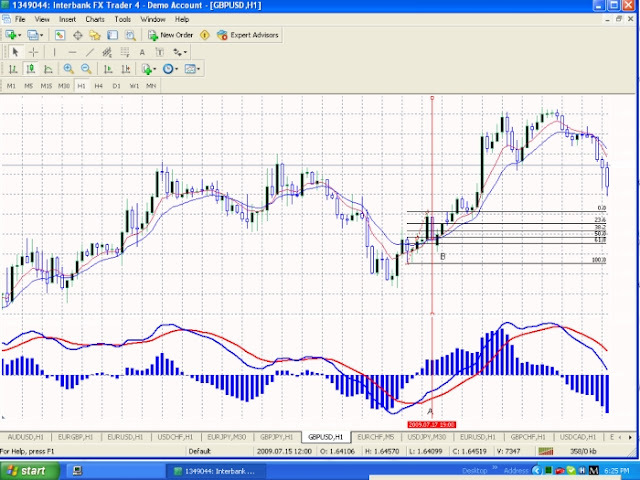 Price went up over 50 pips the stopped around the previous 1 hour swing high. I am a short term trader. I like to see a profit in a relatively short time period. This system though will get you in a move at a relatively safe place (on a retracement). It will get you in to trades right as the big boys are getting in (Banks, Hedge funds etc) based on momentum, so you can ride their coat tails. The best time to trade this system is during the London session and during the New York session and it doesn’t matter if it is the beginning or end of a session as long as there is a trend you can trade the system. Stay away from consolidating markets when trading this system. When major news comes out wait until after about 30 minutes, before you trade, to let the market settle.